If the other parent has Parental Responsibility you cannot take unilateral decisions about your child’s education; you must consult. If you can’t agree the court will have to impose a decision. It is essential for both parents to be involved in their child’s education. This is more difficult if one parent only has weekend and holiday contact, and is one reason why midweek contact is so important, enabling a parent to help with his child’s homework, visit and see the school, and meet teachers and friends. If you do not know which school your child attends but know the general area, you can write to the local education authority and request this information. State your name, the child’s name and your relationship. Ask for the address of the school and name of the head teacher, so that you can write to them and ensure your continuing involvement in your child’s education and development. State that you are making the request under the Education (Pupil Information) (England) Regulations 2005 or Section 7 of the Data Protection Act 1998. Note that not all schools (e.g. 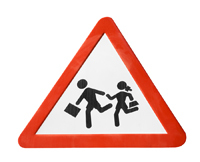 academies) are subject to the 2005 Regulations, so check the small print. · any person who, although not a natural parent, has care of a child or young person. Next, the guidance provides a definition of Parental Responsibility (PR) and the ways in which it may be acquired, and notes that not only parents may have this but that PR for a child may also be acquired by a local authority through a Care Order. A local authority with PR can prevent a parent having contact with their child, even though the parent also has PR. Children may also be taken into local authority accommodation by agreement with the parents without a Court Order. Several people, including the LA, can thus be regarded in law as a child’s parents. The guidance goes on to discuss Section 8 orders and specifically the restrictions Prohibited Steps Orders and Specific Issues Orders impose on the exercise of Parental Responsibility. · Telling parents about meetings involving their child, such as a governors’ meeting on the child’s exclusion. Head teachers must ensure that they have the full names and addresses of all adults who have PR when the child is enrolled. They must also have details of any Court Orders which affect the parents’ exercise of PR. These records must be kept up-to-date and made available to the child’s teachers; they must be forwarded to the new school should the child change schools. Schools are advised that though a custodial mother may ask a school to change her child’s name in its records she may not legally do so without the consent of all those with PR. The school must have evidence of this consent in writing, or a Court Order. A letter from the mother’s solicitor carries no legal authority. If the name has already been changed then it may not be in the child’s best interests for it to be changed back. Note: that if you need to show a school a copy of a Court Order you will need the consent of the court, otherwise you could be in contempt. If a school hasn’t been given the contact details of a non-resident parent it must remind the resident parent that the non- resident parent has the right to be involved in the child’s education and request to be given the contact details. A school can do nothing if the resident parent refuses, but if the non- resident parent contacts the school directly the school must cooperate with them. Generally a school will need the consent of only one parent for a child to be involved in an outside activity unless the activity will have ‘a long term and significant impact’ on the child or if the non- resident parent has informed the school that he wishes to be approached for consent in all such cases. Sometimes one parent will give consent and the other withhold it; this puts schools in an awkward position, and they are advised that the best decision to take is that the child should not participate in the activity. The school would not be taking sides, merely protecting itself from possible legal action should, for example, the child be injured on the trip. The resident parent could be recommended to seek a Court Order to clarify the situation. Schools are in loco parentis for the children in their care and, though they do not have PR for a child, in the event of an accident or the need for emergency medical treatment are enabled by Section 3(5) of the Children Act to ‘do what is reasonable in all the circumstances of the case for the purpose of safeguarding or promoting the child’s welfare’, for example, taking a child to hospital to have a wound stitched. The parents must then be kept informed as soon as possible, so that they can take responsibility for any further decisions necessary. Schools are obliged by the Children Act to make the child’s welfare paramount and where a parent’s action makes this difficult the school should seek resolution with the parent, but should avoid becoming drawn into any conflict. Although the school must treat you equally, it is only obliged by regulations to issue one copy of a child’s educational record or school report; they may charge for further copies but not beyond the cost of supply, so offer to pay for them, and provide the school with a dozen stamped, addressed envelopes. Even if you don’t have contact you’ve a right to this information under the Education (Pupil Information) (England) Regulations 2005. They can only provide you with information to which your child has a right of access. Provided that requirement is satisfied, they must make your child’s educational record available to you, free of charge, within 15 school days of receipt of your written request. If you want a copy they can make a charge to cover their costs. This rule does not apply to nursery schools. Don’t be excluded from your child’s education: go to the school, introduce yourself, arrange a meeting with the head, explain your situation. Your child’s other parent may try to demonise you, don’t argue with them: join the Parent Teacher Association (PTA), turn up at curriculum evenings, get to know all your child’s teachers and discuss progress with them, etc. Become a good, involved parent; demonstrate that your ex is wrong to exclude you; above all, don’t be seen to criticise them to the school. As with doctors, the more involvement you have the better it will appear in court, and the better a parent you will really be. At the next governors’ or PTA meeting ask how the school ensures that any prospective admissions are done with the knowledge of both parents; i.e. do they attempt to ensure that they have the names and addresses of both parents? If your child’s other parent does not give your name and address when they are requested (or claims you are not interested) he or she is acting fraudulently. Remember that in many schools family breakdown is the norm rather than the exception and they really should be geared up for this. In practice the school will tend to follow the wishes of the custodial parent and behave as if you don’t exist; it will prove a challenge for you to obtain any information from them. Receiving an annual school report will come to seem a significant achievement. Schools are often ignorant of the law and misconceptions are common; it is a common (but false) belief, for example, that they can only send out a school report to the non-custodial parent with the permission of the custodial parent. Local authorities tend to act on a case-by-case basis; they won’t always accept a solicitor’s letter, and may demand to see other evidence (birth certificate, Court Order). If you persist they may well forward the matter to their legal department. Take your case to the local education authority rather than to the school; it will be their department which will have to pay the legal costs should you come over all litigious, and they probably can’t afford to defend a case. Refer them to the guidance above; it’s doubtful if it is legally enforceable, but it has helped in a number of cases; remind them that if something happened to your child on a school trip to which you had not given your consent you would sue. An alternative is to phone the helpline of the Department for Children, Schools and Families on 0870 000 2288 and ask them to remind the school of their obligations. Whatever the situation may be thought to be by those concerned in meeting the father's requests, I point out that the father, having obtained a parental responsibility order pursuant to s 3(1) of the Children Act 1989 is entitled to all rights, duties, powers, responsibilities and authority which by law a parent of a child has in relation to the child. The father is accordingly entitled to the same rights as the mother in regard to the receipt of any reports or documents which, for example, the school or doctor may hold. · Make sure you have a record of your involvement, including photographs, so that you can present it as evidence to the judge in Court. It is common for friction to arise where one parent wants to take a child out of school for an event or holiday and the other parent objects. You are legally obliged to educate your child either through mainstream education or otherwise. If you choose to send your child to school you must begin from the term following his or her fifth birthday. You are guilty of an offence under Section 444 of the Education Act 1996 if your child does not attend school regularly, but regularly is not defined. If you wish to take your child out of school during term time, which can be disruptive both to your child’s learning and to the school, you must get the written permission of the head teacher. You must have a very good reason. Schools expect an attendance record of at least 95% and will allow an absence of a maximum of 10 days in any school year. An unauthorised absence will result in both parents being issued with a penalty notice and you may be fined £50, rising to £100 if the fine is not paid within 28 days. If there is repeated poor attendance at school the Education Welfare Service will become involved and suggest possible ways of dealing with the situation. Feedback received from 4 customer(s). Good advice and never forget that your child has rights (especially once in high school). I had issues with communications and the recording of contact details. After trying a friendly approach and recieving overly defensive responses with a refusal to act unless both my estranged wife and I wrote and signed a letter supplying instruction. I was able to force the issue through data protection and the threat of formally complaining to ICO. The child is the schools customer, the records belong to the child, the childs wishes are paramount. If the child is old enough, let them dictate to the school what they want to happen. Good common sense information, I'm going through a similar issue at the moment but I honestly believe a lack of resources at my child's school is the root cause. If the school still do not comply then a letter to the chair of the board of govenors for the school might do the trick, a letter can be left with the school or the chair-person can usually be contacted via a liason from within the area education support network, try looking in your local councils website. Good common sence information, I'm going through a similar issue at the moment but I honestly believe a lack of resources at my child's school is the root cause. If the school still do not comply then a letter to the chair of the board of govenors for the school might do the trick, a letter can be left with the school or the chair-person can usually be contacted via a liason from within the area eduction support network, try looking in your local councils website.